From its almost accidental birth in 1968, 60 Minutes has set the standard for broadcast journalism. The show has profiled every major leader, artist, and movement of the past five decades, perfecting the news-making interview and inventing the groundbreaking TV exposé. From legendary sit-downs with Richard Nixon in 1968 and Bill Clinton in 1992 to landmark investigations into the tobacco industry, Lance Armstrong’s doping, and the torture of prisoners in Abu-Ghraib, the broadcast has not just reported on our world but changed it, too. Executive Producer Jeff Fager takes us into the editing room with the show’s brilliant producers and beloved correspondents, including hard-charging Mike Wallace, writer’s-writer Morley Safer, soft-but-tough Ed Bradley, relentless Lesley Stahl, intrepid Scott Pelley, and illuminating storyteller Steve Kroft. He details the decades of human drama that have made the show’s success possible: the ferocious competition between correspondents, the door slamming, the risk-taking, and the pranks. Above all, Fager reveals the essential tenets that have never changed: why founder Don Hewitt believed “hearing” a story is more important than seeing it, why the “small picture” is the best way to illuminate a larger one, and why the most memorable stories are almost always those with a human being at the center. “As traditional reporting is increasingly being challenged by high-decibel, opinion-drenched media, Fager highlights storytelling that conveys a deep understanding of issues and demonstrates the power of television to inform” (The Washington Post). 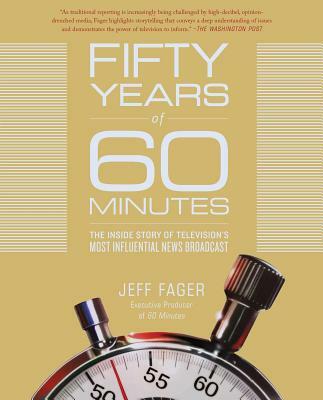 Fifty Years of 60 Minutes is at once a sweeping portrait of fifty years of American cultural history and an intimate look at how the news gets made.